Ok, maybe not as good as Shackleton…. We have arrived in Golfito, Costa Rica, after 5 days, 21 hours. We made great time, a full day less than our reasonable estimate thanks to the favorable currents we followed. Except for our last-day worries about the engines, which we have to address before we venture out again, it was largely uneventful. We celebrated our arrival with homemade fudgesicles, a happy accident when my chocolate pudding demulsified (is that a word?) and we poured it into the popsicle molds. So. Here we are. Our next step is to decide whether to stay here or move to another Costa Rican port, but that depends on how and where best to ship in our new rig. For the coming week we’ll be researching and calling and deciding so many things and hoping to get the ball rolling on making Escape Velocity whole again. Once we have things ordered we can sit back and relax while we wait for things to arrive but for now, there is work to be done. 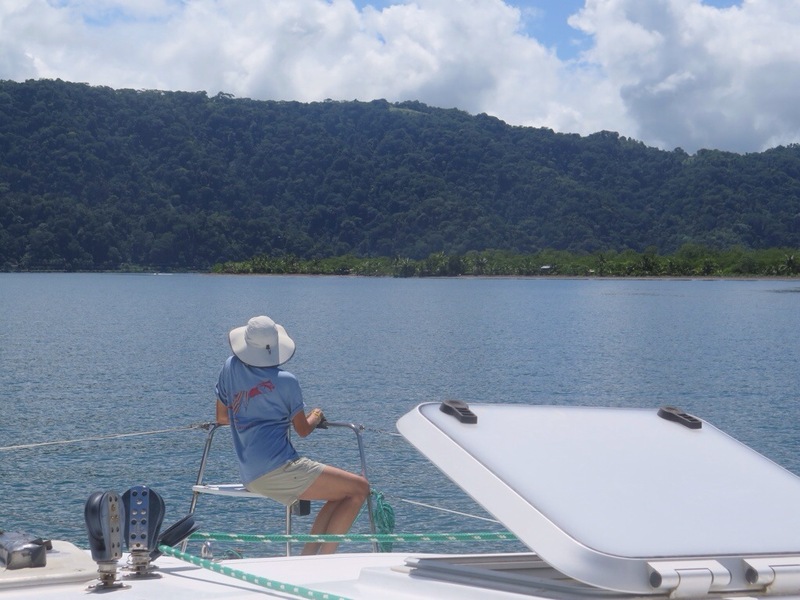 Yesterday, as we sunk into a mild depression over our poor overworked engines, we got a surprise call from Mark and Sue on Macushla in the Caribbean and they perked us right up. It was so good to hear their cheerful and encouraging voices and it gave us the energy we needed to do one more night of motoring. We had a tense night watch knowing we would start to encounter boats going to and from the Panama Canal from the west coast. As we altered course to head more directly to the bay we gave up our great speed but that was ok since we never want to make landfall in an unfamiliar port in the dark. Jack took over at midnight and only saw one ship — I had seen three — so the shipping lane was a nonevent, thank goodness. Just after 5 am Jack woke me with an excited nod out the porthole, “Costa Rica!” He was misty, and when I looked at the beautiful coastline I was misty too. We had done it. We had brought our home, our magic carpet, back from the brink and there’s no doubt now that she will be good as new before long. Ever since our dismasting there’s been an unspoken fear in the back of our minds: if we can’t get EV back to a safe harbor where she can be repaired, we will have to abandon her. When you call for rescue on the high seas they rescue you, not your boat, and generally an abandoned boat is a hazard to navigation and has to be scuttled. We know of two recent instances where that happened and we didn’t want it to happen to us. From the very beginning we never even considered calling for help, knowing that calling for help, setting off our emergency beacon, meant saying goodbye to our boat, our home, our dream. We feel lucky. We’re lucky the falling rig didn’t put a hole in the boat and we’ve never questioned our decision to let the rig go, knowing we had no way to get it back on deck and couldn’t possibly tow it 400+ miles against wind and current. We’re lucky we had enough fuel — if barely — to get back to the Galapagos so we could rest and prepare for the longer passage. Had we lost the rig a day later, we wouldn’t have made it. We’re lucky we had friends in Isabela and Santa Cruz who encouraged us and helped soothe our frustrations at the bureaucratic labyrinth we had to negotiate to get the fuel we needed to proceed. We’re lucky for the warmth and concern our insurance company team have shown during our slow-motion self-rescue. Most of all, we’re lucky to have each other. Together we can do this next step, together we’ll make a new plan, and together we’ll enjoy every day of this journey. Tonight we celebrate our landfall. It’s not the one we planned for, Fatu Hiva, but it’s beautiful all the same. The rain that’s falling is filling our water tank and washing away the salt from a tense passage.